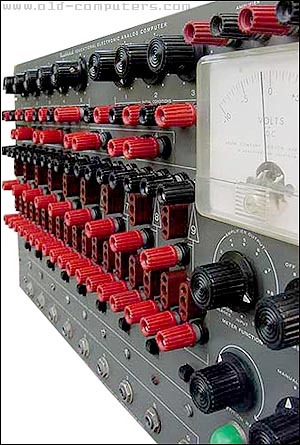 From 1950 to 1965, electronic analogue vacuum-tube computers were used to design, test and run civilian and military equipment like aircraft, ships or rockets. The first systems were very expensive. However, components cost (especially vacuum tubes) was steadily decreasing. In 1960, Heath Company launched the Heathkit EC-1, the first analogue computer (almost) anyone could afford. It was sold in kit or pre-assembled forms and was quickly and widely used in industry and universities. Unlike our modern binary computers which accept only two values as entry (0 or 1), an analogue computer represents input and output data's in voltage levels. So, any positive or negative value could be read directly from the built-in meter. An external oscilloscope could be also used as a display device, as well as a grapher for printed results. In spite of its apparent simplicity, the EC-1 could solve a multitude of complex mechanical and mathematical problems thanks to nine DC operational amplifiers, three initial condition power supplies, potentiometers, relay contacts, high precision resistors and capacitors, and a built-in oscillator for repetitive operation (from 0.1 to 15 operations per second). The computer was described by Heathkit as "Excellent teaching aid for a course in computer electronics - Vividly illustrates the electronic analogies to mathematical problems - Handles problems as complex as fluid flow, damped harmonic motion, and flight of a projectile in a viscous medium"
Computer problems could be 'programmed' by inserting several patch cords into the problem-board sockets and thus linking in chain several built-in components together. The EC-1 and other analogue computers were used until 1965, when first affordable digital computers became available. Amplifiers: Open loop gain approximately 1000. Output -60 +60 volts at .7 ma. SIZE / WEIGHT 50,2 (W) x 38,1 (H) x 29,2 (D) cm. / 21 Kg. see more Heathkit EC-1 Ebay auctions !